The speed and scale of the energy transition demands comprehensive, far-reaching action on behalf of asset owners. It is now clear that historic approaches to the challenge, such as divestment and screening, are unlikely to be enough to counter the extent of systemic climate risk that exists within institutional portfolios. The energy transition requires a new investment framework which encompasses both winners, the companies likely to benefit most from decarbonisation, and losers, those unable to adapt to a low-carbon world. 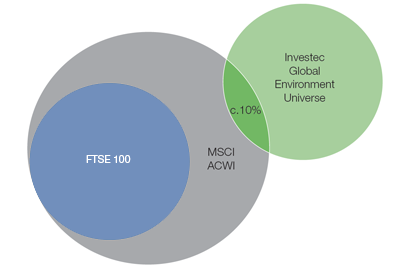 The Investec Energy Transition Investment Framework is divided into four quadrants: Sustainable growth, cash returns, carbon risk and green bubble. Applying this investment framework should ensure that asset owners can manage carbon risk in portfolios via better measurement and careful engagement while gaining exposure to companies who can provide solutions to the enormous environmental challenge we face. Engagement is a strong feature of energy transition investment, irrespective of which portion of the framework a company sits in. In particular, we believe that a systematic programme of engagement can bring about material change in the way hydrocarbon companies manage their business. The energy transition demands positive investment. 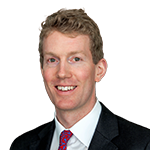 Applied correctly and holistically to a portfolio, the framework can help an asset owner to gain exposure to the enablers and beneficiaries of decarbonisation and provide a hedge to offset the systemic exposure to carbon inherent in today’s portfolios. The speed and scale of the energy transition demands comprehensive, far-reaching action. It is now clear that historic approaches to the challenge, such as divestment and screening, are unlikely to be enough to counter the extent of systemic climate risk that exists within institutional portfolios. The energy transition requires a new investment framework to support both thought and action. This framework encompasses both winners, the companies likely to benefit most from decarbonisation, and losers, those unable to adapt to a low-carbon world. Principle 1: The energy transition is as much a diversification of energy sources as it is a rise of renewables. As we explain in Burning the Midnight Oil, asset owners should not be surprised to see renewables surpass coal and gas, rather than replace them entirely. Principle 2: This transition is not binary. From an investment perspective, not all renewables are necessarily “good” investments and not all companies currently relying on generating income from carbon are “bad”. There are good and bad investments on both sides. This includes forward thinking hydrocarbon companies that benefit from engagement and monitoring from their shareholders and uneconomic or uncompetitive renewable solutions. 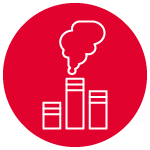 Principle 3: Too much of the discussion around portfolio risk mitigation in an energy transition is focussed on divestment and carbon avoidance, rather than positive allocation to companies which can enable the process of decarbonisation. These companies should enjoy structural growth, are typically under-represented in portfolios, and act as an offset against carbon risk in other parts of the portfolio. Applying this thinking through the investment framework should ensure that asset owners can manage carbon risk in portfolios via better measurement and careful engagement while gaining exposure to companies who can provide solutions to the enormous environmental challenge we face. 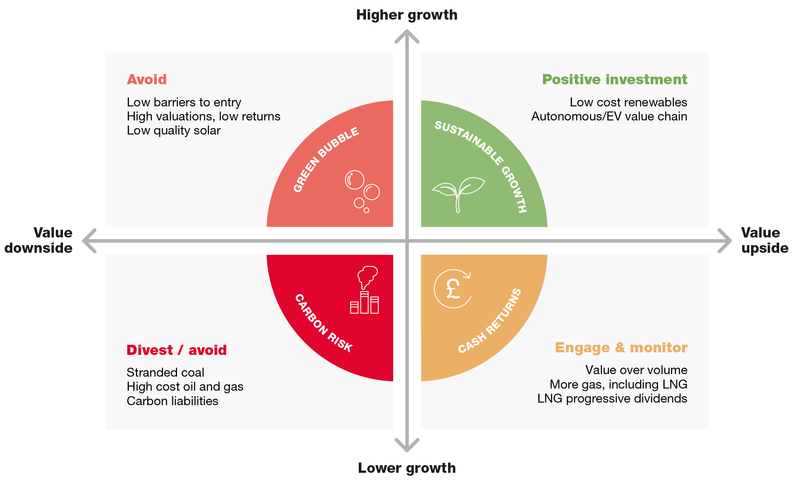 Acting as a lens through which to view your portfolio in reference to climate risk and the energy transition, the framework divides investments into four quadrants, as follows. How can these quadrants be applied to your portfolio? Predicting which companies will be hurt most by climate risk requires an assessment of a considerable number of unknowns, including global demand for multiple energy sources, carbon pricing, and changes in consumer behaviour. A positive allocation to businesses set to benefit from the transition to a low-carbon economy is arguably more straight-forward. These are the winners of the energy transition – rapidly growing companies that will act as the engine of profound change in the way people work, travel and obtain and use their energy. These companies are exposed to renewable energy, resource efficiency and electrification. We have developed a proprietary model to identify these companies which we refer to as the global environment universe. 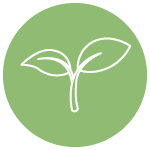 The approach seeks to actively reduce carbon emissions and focusses on companies that can provide environmental solutions. These are businesses that can both enable and benefit from the multi-decade process of decarbonisation. The framework calls on asset owners to ensure they’re positively exposed to these sustainable growth companies which can also provide important attributes to offsetting the systemic climate risk that exists in portfolios. One of the most important traits of the global environmental universe is its inclusion of Scope 3 carbon. As we set out in Implications for Asset Owners, Scope 3 emissions come from the entire corporate value chain and comprise an estimated 75% of the carbon emissions attributable to a global equity universe. Quantifying these emissions requires the assembly and interrogation of specific data, which is why our research approach includes a partnership with the only public, fully transparent ranking of the world’s largest companies by their Scope 1, 2 and 3 carbon emissions. Successful allocations to sustainable growth assets, based on comprehensive data and selected from the global environmental universe, should not only afford access to growth companies but also provide an effective hedge against a portfolio’s existing carbon risk. This can also enable an asset owner to create effective diversification opportunities away from traditional asset allocation. These are companies which are structurally exposed to the energy transition by virtue of their existing business in energy, mining or heavy industry. Many of them are oil companies – facing questions about their future in a world where people will use less of their end product, what their survival strategy might look like and how the investment community should treat a sector generating significant cash flows and dividends but responsible for large carbon emissions. Option 1: Business as usual, with little or no concession to the prevailing threats around the business model or changes in investor needs, perhaps a reduction in frontier exploration, high-cost oil development and a marginal pivot towards natural gas. Option 2: Run the business for cash and return it to shareholders. This liquidation strategy implies no growth capex, significant asset sales and a slow wind-down of all operating activities. Option 3: Develop expertise in renewable energy and integrated energy solutions and evolve the business model into an energy transition company. This is likely to include an increased focus on natural gas, a significant reduction in oil-related capex, and a strong commitment to return excess cash to shareholders in the form of dividends and buy-backs. The Cash Returns quadrant of the framework is focussed on companies who pursue option 3. The best examples of this so far are the European integrated oils sector, such as Royal Dutch Shell, Total and BP. All three companies have taken direct exposure to solar, wind, electric vehicle charging, battery technology and biofuels, while tilting their oil & gas activities away from high-cost oil and towards global gas. They have also engaged with shareholders and pressure groups on the evolution of their business models, the measurement of emissions, and alignment with the Paris goals around global warming. Engagement is an essential element of the Energy Transition Investment Framework, and it is most important in the Cash Returns quadrant. We expect investors in Cash Returns companies to engage closely with all aspects of corporate performance. 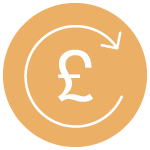 We believe that a systematic programme of engagement can bring about material change in the way these companies manage their business, and that this is a more effective way of managing carbon risk than simply selling carbon companies. In February 2019, Glencore committed to cap its coal production, bowing to pressure from investors including Investec Asset Management to take firmer action to prevent runaway climate change. This followed on Shell’s plans to set short-term targets in December 2018 as part of a long-term ambition to reduce the Net Carbon Footprint of its energy products. “Meeting the challenge of tackling climate change requires unprecedented collaboration and this is demonstrated by our engagements with investors,” to quote Shell Chief Executive, Ben van Beurden. Coal is now more expensive than renewable energy on a global basis and the gap is going to widen, underlining the financial as well as the environmental risks of investing in coal. This will affect coal-exporting countries as much as mining or energy companies. High-cost oil & gas and utilities focussed on carbon will also be negatively impacted by the transition to a lower carbon future. For those energy companies lacking the ability or willpower to evolve, characterised by option 1 outlined in Cash Returns, we expect the energy transition to be increasingly Darwinian. Investors will avoid them, and in some cases actively divest. Importantly, carbon risk is not just present for companies extracting oil, gas and coal. Other companies that use fossil fuels as inputs for production, require carbon intensive supply chains or produce carbon intensive products are also at risk in the energy transition. This leads to the need for better disclosure and better data from companies to ensure a comprehensive understanding of carbon emissions. The inclusion of scope 3 data is an important step in any investment framework to understand carbon risk. The mining sector is an interesting case study and one that is easily oversimplified. On the one hand, certain mining companies are heavily exposed to coal, both thermal and metallurgical. On the other hand, this industry has a key role to play in the extraction and development of materials such as lithium, nickel, cobalt and copper which will have a central role to play in the evolution of battery, storage and electric vehicle technology. The extraction of these metals presents considerable challenges on the social, safety and governance side, nowhere more so than in the Democratic Republic of Congo. All of which supports our view that systematic engagement, measurement of data, and collaboration is a critical part of understanding where companies fit in the framework, alongside considered divestment. Just as exposure to stranded coal, high cost oil & gas and carbon-intensive utilities looks disadvantageous in the long-term, so we expect to see destruction of value in the final quadrant of the energy transition framework, for which the term Green Bubble is appropriate. These are companies and assets which appear to be exposed to the de-carbonisation of the global energy system, but in economic terms will prove to be unprofitable. The challenge for investors will be distinguishing between Sustainable Growth and Green Bubble companies: both groups will be exposed to the same industry trends, but we expect very different investment outcomes. In Sustainable Growth, we look for companies with structural growth, sustainable returns and competitive advantage, defined by market share and technology. 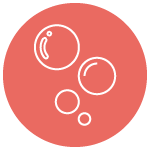 Green Bubble companies will be defined by low barriers to entry, no cost advantage, and low returns. These businesses will see ‘profitless growth’ and will not deliver sustainable returns for shareholders. Low-quality solar could be a good example of this, as well as parts of the battery value chain – just as airlines and fixed-line telephony have proved to be low-return industries in the past, despite strong growth rates and adoption curves. We have also laid out our thinking in The Rise of Renewables on the false promise of Carbon Capture and Storage and some negative emissions technologies (NETs) – at least in the timescale required of the energy transition. These could enjoy similar growth but we do not expect them to generate sustainable returns. Utilities and independent power producers are on the front line of the energy transition. Over time, transportation, heating and low temperature industrial processes all need to electrify if we are to meet carbon reduction goals. Utilities are the main investors funding the rise of renewable energy but are also the biggest owners of increasingly uneconomic fossil and nuclear capacity. Some of the more forward-thinking utility companies are already well into this energy transition and have established a competitive advantage, either through fast adoption of new technology like offshore wind or early investment in development assets – which makes them the owners of the best sites on which to build new renewable assets. Regulated utilities with constructive regulators in general should have an easier transition, with many already sitting in the Sustainable Growth quadrant, and they will see a prolonged period of growth in grid investments to facilitate intermittent renewables and electric vehicles. Independent power producers face a more mixed outlook. Merchant power markets are designed to optimise for short-run marginal cost and struggle to deal with zero marginal cost renewable resources. Deregulated power markets will need to be redesigned to include capacity markets and/or be re-regulated. This transition is unlikely to be smooth in all instances and can be equally painful for owners of merchant wind and solar assets as with owners of merchant fossil. Coal-heavy intransigent independent power producers with high financial leverage who continue to invest in obsolete technology sit in Carbon Risk, while peers paying high dividends but not growing sit in Cash Returns. Undifferentiated owners of merchant wind and solar in markets where power prices will come under threat from the saturation of renewables are in the Green Bubble section while regulated utilities and heavily contracted independent power producers with large visible renewable pipelines are in the Sustainable Growth quadrant. As this shows, we see utilities and independent power producers in all four quadrants of the framework. Not unlike the oil & gas sector, utility companies need to evolve rapidly to enable the energy transition. For those that cannot do this, the future looks very bleak indeed. The energy transition demands positive investment. The framework facilitates that positivity. While engagement, assessment of hydrocarbon assets and other components all play their part, none are as important as dedicated, concerted and separate investment in Sustainable Growth assets. Applied correctly and holistically to a portfolio, the framework can help an asset owner to reduce under-exposure to the enablers and beneficiaries of decarbonisation and provide a hedge or insurance to offset the systemic exposure to carbon in current portfolios. In this series, we have provided context and explanations of the energy transition, supported by data and examples to demonstrate the likely winners and losers, before presenting the framework for action. We will continue to provide more examples, case studies and data across assets, sectors and asset classes as the energy transition plays out – to support asset owners implement the framework. We introduced this series by stating that climate challenge is an existential threat. It is one of the greatest tests ever faced by humanity. According to the Intergovernmental Panel on Climate Change (IPCC), the UN body for assessing the science related to climate change, humans have until just 2030 to meaningfully reduce carbon emissions and, more broadly, should target limiting temperature rises to 1.5ºC, rather than 2ºC. We encourage readers not to lose sight of this. We can get there if we act quickly. 1The Investec Energy Transition Framework reimagines the original BCG growth share matrix in an accelerating energy transition. Acknowledgments include Deutsche Bank Research and A framework for Analysing the Pace of Technology Substitution (2016) – Harvard Business Review.